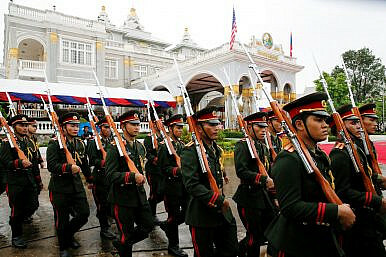 Laos soldiers wait for U.S. President Barack Obama's arrival at the Presidential Palace in Vientiane, Laos (September 6, 2016). The inquisitive visitor to an authoritarian state is often left trying to find crumbs of answers to the question: Does the populace actually like the regime and believe its lies? In some cases this is easier than others. When I visited Cuba some years ago, it was obvious the answer for many people was no. In the bars and restaurants, where Cubans strike up conversations only to footnote it with the request you buy them food or drinks, they would happily recount the problems in society and, over a watery Cuba Libre, a longing for change. Such was the puissance of blackmarket capitalism that it came to resemble an open protest against the central-command economy. As for lies, one aged man told me people have come to appreciate the truth by what is not reported by the state media. In Vietnam, too, one can sense the disaffection with its nominally communist regime, from the part-rumour, part-fact roadside chitchat to the increase in protests now taking place. But, when one visits Laos, the question is a lot more difficult to answer. A recent article in the Economist suggested that Laos “has what may be the world’s most closed political system after North Korea.” True, few specifics are known about the upper echelons of the Communist Party, and it is very much a closed club, though the adjective most might be a stretch too far. We do know, for example, what happened at the 10th Party Congress in January: Former Vice President Bounnhang Vorachit moved up to become secretary general and president, replacing Choummaly Sayasone, who had been in power for a decade. And Thongloun Sisoulith replaced Thongsing Thammavong as prime minister, alongside several other reshuffles. A self-criticism sometimes takes place. But unlike North Korea, Laos hardly has a closed society. Its border are porous. In Vientiane’s shared tuk-tuks I could speak freely to a young Laotian, who spoke some English, as I could at an after-hour party in a Luang Prabang nightclub. Televisions broadcast news from Thai stations, allowing Laotians as much information as Thais (which is significantly more than their local stations) as well as from Western channels. Few sites on the internet are actively blocked. A Laotian who knows how to access the websites run by the diaspora can read just how invective his fellow countrymen are about the regime. And one that reads English can learn what the international media thinks of his country, and what is happening elsewhere in the world. Before me lies a copy of the Vientiane Times, the English-language daily, dated September 12. Though little revealing is written about Laos, I can learn from a syndicated article that Indonesians are fighting corruption online, and just how they’re doing it, for example. As for the local Lao-language press, most would agree the ink could be spared. But as most subjects of authoritarian government know, modern-day samizdat is found online. The number of Lao internet users has spiked in recent years and some have found it a convenient way to air their thoughts. Ounkeo Souksavanh used to work as the host of a radio show, based in Vientiane. Wao Kao (News Talk) was popular and one day, in late 2011, a listener called in to complain about land grabbing by a son of a Politburo member. Nothing happened to Ounkeo at the time, and the government even appeared to show some interest in tackling the issue of land appropriation. However, then came the disappearance of civil society leader Sombath Somphone in December 2012 (more on that later) and, as the air began to feel more chilling, Ounkeo decided to leave Laos for his own safety. He eventually found his way to the United States, where he now works as a journalist for Radio Free Asia. Speaking to me this week, he said he thought a democracy movement was beginning in Laos. “It is from the urban middle class who can get access to information and social media. The indicator is that they reflect their perceptions and opinions on Facebook,” he suggested. The fact that the Laos regime is stepping up efforts to monitor and censure the Internet speaks volumes. But it is not just online where efforts are being made to stop criticism from seeping out of the country, and, more importantly, seeping throughout the country. In Latin America, there is a word for people who leave their homes one morning and never return. It is desaparecido. In Laos, the most famous desaparecido is Sombath Somphone, a civil society leader. On the evening of December 15, 2012, he was stopped by the police at a checkpoint in Vientiane. A motorcyclist approached and drove Sombath’s car away. CCTV then captures him being thrown into a truck, never to be seen again. The regime claims it was a private dispute between Sombath and another individual, and does not know his whereabouts. “Before the disappearance of Sombath, there was some optimism that civil society could be a force for change in Laos. Since his disappearance, such hopes have been virtually extinguished, since most people are now too scared to do anything that might rile the regime,” Martin Stuart-Fox, professor of history at the University of Queensland, told me last year. Indeed, when the ASEAN Summit took place in Vientiane this month, there was no space provided for the “People’s Forum,” a civil society led meeting that typically convenes alongside the event. Instead, this year, it was held in Timor-Leste. One might reasonably conclude, at this point, that the avenues available for criticism are being narrowed in Laos. But this raises a corollary question: Is there much to complain about? In I Shot the Buddha, the latest novel in the Dr. Siri Paiboun series, written by Colin Cotterill and all set in Laos, the senior Party member Judge Haeng provides an explanation for why the regime is trying to stamp out Buddhism and animism. “A good socialist,” he says, “does not need to believe in the phantoms and freaks of folklore or religion because he has Communism to fulfil every need.” A fictionalized statement, of course, but Cotterill captures the central impulse of any communist party, even one that has swapped Marxism for capitalism. Today, one would need only to replace “the phantoms and freaks of folklore or religion” with “the human rights, the vote, and the freedom of speech of democracy and liberalism” to understand the political situation: the vote is not needed because the Party selflessly takes on the strain of governance; freedom of speech is not needed because the Party provides its populace with what’s true or false; and, to the end, democracy is not needed because it would do away with the Party, which fulfills every need. Older party loyalists in Laos might remember the old Marxist “moral versus material” debate (otherwise known as the subjective-objective dispute): Is revolution achievable when the material conditions in society are ripe, or when the moral will of the people is ripe? One may reasonable apply this to the question of how democracy would come about in Laos. Moral: the desire by Laotians to choose their government and choose which laws inflict upon them. Material: that the regime has failed to “fulfill every need” and it no longer tenable. Laos, much like Vietnam and China, went through its own perestroika, while leaving glasnost on the sidelines. In 1986, after years of economic woe, Laos finally dropped its command economy for the free-market with a policy known as the “new economic mechanism.” Since then, the economy has developed to become one of the fastest growing in Southeast Asia, though it remains one of the region’s poorest counties. If this is true, then economic growth is essential. And the government promises a great deal. In April, the National Assembly approved the country’s 8th five year National Social Economic Development Plan, for 2016-2020, as well as a ten year plan and a 15 year plan. According to the shorter one, GDP per capita will be $3,190 by 2020, taking Laos out of its Least Developed Country status. The national poverty rate will also be cut to below 10 percent of the population within four years. Optimism might be the best adjective for these plans; unachievable might be another. But a short visit to Vientiane will reveal a brand new shopping mall (though on the day I visited it was visibly empty) and a bounty of new high-rises. However, the few people of Vientiane who would openly speak to me said that the cost of living was rising, for many perilously. Radio Free Asia reported as much in August: an unnamed senior official in the Ministry of Industry and Commerce told the news site that food prices have risen by an average of 30 percent since last October in the capital. Sticky rice, a staple, had gone from $1.05 a kilo to $1.50 (twice as much as in neighboring Thailand). Beef, for another example, went from $9.55 a kilo to $10.80 (forty percent more than in Thailand). Those with the means skip across the Thai–Lao Friendship Bridge, just outside of Vientiane, and purchase the necessities from markets in Thailand’s Nong Khai. But many don’t share this luxury. The problems, however, appear to go much deeper. “Laos has a budgetary crisis so it cannot pay salaries to the state employees on time. It still relies on foreign aides. And tax collection does not achieve the goals due to corruption,” Ounkeo told me. He added, sarcastically: “Is that called economic stability and financial progress?” Probably not. What’s more, outside of the capital, the material conditions for many people are not improving. The evictions, brutality, and poverty caused by the construction of dams along Laos’ portion of the Mekong has been fairly well covered by the media in recent years and does not warrant any further discussion, as long as one understands the level of suffering, and resentment these projects are creating. Here, one can return to Phuong Nguyen’s contention. If Laos can deliver better economic opportunities and prosperity for its people, then the regime may be given the benefit of the doubt, and survive. But, if the claim that the Party “fulfills every need” is shown to be false, then the material situation might leave many Laotians demanding a change in their political system, and the creation of a government that, at least, listens to their demands. But what are the moral demand for change? This is hard to gauge, given how the regime is cracking down on dissent, and harder still to quantify. Ounkeo told me that he believes there is no group of intellectuals ready to demand democratic change in the country. This is probably the case, but there are some people who had demonstrated, admittedly years ago, for change. Last year, I spoke to a self-exiled dissident who goes by the nom de guerre (his term) Soumaly. He was a member of the Lao Student Movement for Democracy and participated in the group’s fateful attempt at a protest march on October 26, 1999. It took place in Vientiane and lasted a matter of minutes. At least 100 demonstrators were arrested, a number of whom, including the supposed leader of the group, were tortured by the authorities and handed 20-year prison sentences. One is believed to have died in jail. In 2009, to mark the tenth anniversary of the protest, another went ahead, but was also stopped early. Little is known of the fate of those arrested. When I asked if he thought it possible for the Party to reform itself, a Lao glasnost, he was dismissive. “There will never be real change as long as a single authoritarian political party governs Laos,” he said. “The new blood that will come to replace the old guard are just the children or family members of these old farts.” Instead, he suggested that change can only come below, from the people, from those who have seen beyond the lie that the Party “fulfills every need.” Perhaps, in the end, change will necessitate a combination of moral and material factors before it happens.